(Newser) – A young Saudi Arabian woman who barricaded herself in an airport hotel room in Bangkok, saying that her life will be in danger if authorities send her back to her family, has won a reprieve. Thailand authorities will allow her to stay, at least temporarily, while they investigate her case, reports Reuters. 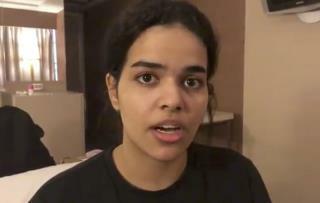 Rahaf Mohammed al-Qunun, 18, had told the New York Times that her homeland is like a "prison." She said she managed to escape her abusive family while on a visit to Kuwait—which, unlike Saudi Arabia, does not require women to seek the approval of a male guardian before traveling—but was stopped at Bangkok's airport Saturday and tricked into surrendering her passport before she could catch a flight continuing on to Australia. Thai authorities had planned to send her back to Kuwait, but she said her brothers and other family members would be waiting to kill her. And these are our 'allies'...? Not only kill her but they will eat her too with sucking blood as Saudis are brutal vulture cannibals. Like that journalist fate their so-called cannibalistic King or bloody prince also would partake the cannibalism as he got the real taste now. And no way she sent to Saudi back. Saudi Arabia is becoming a pariah state with the mad evil master MBS around. Backlash time.